Visitors often ask Lilly Librarians where we get all of our wonderful treasures. Of course we began with a generous donation of over 20,000 books and 17,000 manuscripts from J.K. Lilly, Jr. Since his gift in the mid-1950s, we have acquired many fascinating, beautiful, and unexpected items through purchase and donation, and we’ve learned that you never know when someone you meet might have an interesting story to tell and item to add to the library’s collections. Ben Motz’s donation of a pair of Spock’s ears, worn by Leonard Nimoy in Star Trek VI, with signed photo. The IU campus recently welcomed George Takei, who played Sulu on Star Trek, and his powerful talk reminded us of Trek’s longstanding commitment to diversity, curiosity, and exploration—all values shared by Indiana University and the Lilly Library. 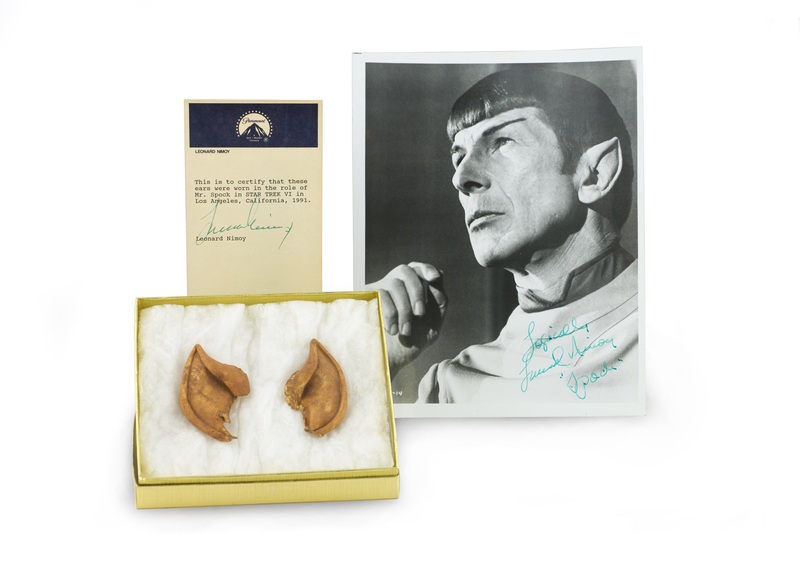 We love the story of Spock’s ears, we extend very warm gratitude to Professor Ben Motz for his kind donation, and we look forward to continuing to share all our Star Trek collections with fans on campus and around the world. You can request Spock’s ears through our online request system.